Key Specifications (Click on Data Sheet Above for Additional Details). 4.1/9.5 Mini DIN adapter PE91216 is one of over 40,000 available RF, microwave and millimeter wave components from Pasternack. Our 4.1/9.5 Mini DIN to type N adapter is a between series coaxial adapter design. This 50 Ohm 4.1/9.5 Mini DIN adapter is precision manufactured to RF components industry specifications and has a maximum frequency of 6 GHz. 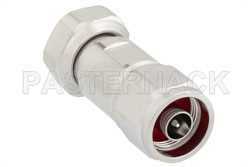 4.1/9.5 Mini DIN male to type N male adapter is one of the many RF components that ship same day as they are ordered. 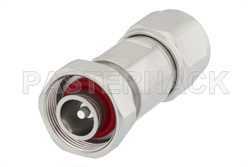 PE91216 male 4.1/9.5 Mini DIN to male type N adapter has a straight body. This Pasternack straight 4.1/9.5 Mini DIN coax adapter is a in-line RF adapter. Our male 4.1/9.5 Mini DIN to male N type adapter PE91216 is shipped from Pasternack's ISO 9001:2008 facility the same day as purchased. This 4.1/9.5 Mini DIN to type N radio frequency adapter is part of over 40,000 RF, microwave and millimeter wave products that ship the same day worldwide, including custom cable assemblies.